So I started over with a fresh install of OS X 10.6 recently, and wanted to restore my Python development environment. 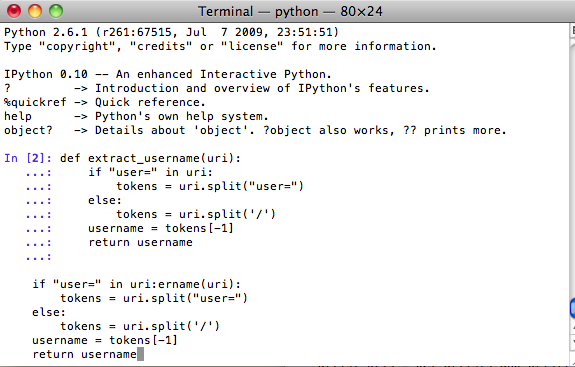 In doing so, IPython is absolutely essential if you want a sane interpreter environment to test out code. I had a bit of trouble with it though. Fixing IPython’s bugs are beyond my ability. While I certainly don’t want to delve into the quagmire that is GPL vs BSD licensing, I do understand why Apple would want to avoid the viral nature of the GPL and ship libedit instead. However, using a genuine Readline library is going to be the best recourse for this problem. I already have a copy of readline compiled and ready to go, and just need a new version of readline.so, the library that links Python to readline. Sifting through my records, I came across a SelfSolved problem record from my good friend Hannes who had issues with his IPython command history. Being the inquisitive sort, I also wondered how I would be able to reproduce this work from scratch. readline.so ships with the Python source package, but surely I would not be required to compile a whole new copy of Python for one measly module library? I documented this process in SelfSolved again: building readline.so for Python. At some point I should write an interface between SelfSolved and WordPress so that I don’t have to reproduce a lot of my work here manually. This is actually fairly easy. 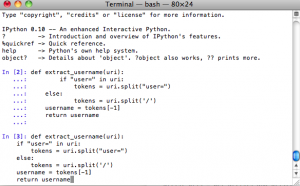 Get a copy of the Python source code. 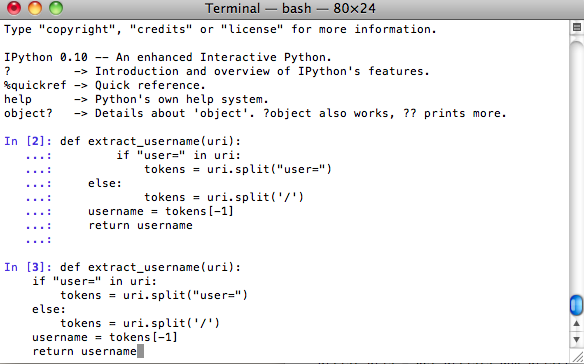 In OS X 10.6, it ships with Python 2.6.1. Unpack it and go into its directory. You should find a Modules subdirectory. In it is readline.c, the source file for readline.so. where the -arch flags should be whatever processors you wish to support, the -I arguments should point to the directories that contain header files for the readline library and the Python framework, and the -L argument should point to the path for the readline library. Use whatever optimization flags you feel comfortable with, instead of -O2, if you wish. So now we have a readline.so that’s properly linked to readline.dylib. The thornier question is how to override the system-provided readline.so. The system version is located at /System/Library/Frameworks/Python.framework/Versions/2.6/lib/python2.6/lib-dynload/readline.so, and the naive would simply overwrite it with their new readline.so. This is a bad idea. As I have mentioned in the past, overwriting system libraries in OS X is an unhealthy thing to do. The problem is that Apple furnishes no official package management system — anything you personally change is considered fair game for the next official system update. On the next system update, if the Python component is affected by the update, the Apple updater will happily clobber your compiled files with its own, leaving you suddenly back at square one. You don’t know how many times I’ve had to recompile emacs (for X11 support) on OS X 10.4 because of this little annoyance. Leave things in the /System/Library directory hierarchy alone, for your own sanity. However, in this case /System/Library/Frameworks/Python.framework/Versions/2.6/lib/python2.6/lib-dynload comes ahead of the user-modifiable /Library/Python/2.6/site-packages directory on Python’s sys.path. So if you just drop readline.so into site-packages, the system version still takes priority. There are a few ways to do this. For one, you can create a sitecustomize.py in /Library/Python2.6/site-packages. 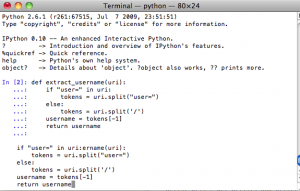 In this file, arbitrary Python statements can be written, and the interpreter will automatically execute them at runtime. So, you can add a sys.path = ["/dir/here"] + sys.path statement and point it to a directory containing your readline.so file. Alternatively, you can abuse the technique used in the easy_install.pth file. It turns out that if you ever used easy_install, directories pointed to by the easy_install.pth file takes priority over the system paths. They use an interesting way to accomplish this, which you can copy. Or, you can just insert your directory containing readline.so into easy_install.pth. In any case, this will force the readline-based readline.so to take precedence over the libedit-based readline.so, without overwriting anything. So for any sane person, the easy solution should be enough. For the rest, the hard solution is an interesting exploration of how some of Python’s built-in modules can be compiled and inserted individually. Thanks a lot, I never knew readline was easy_installable. Thank you! The history scrambling in iPython was getting annoying. Great thanks, this post is really helpful. The weird behavior of scrolled up the history is fixed now.